What should we expect from Kingdom Hearts [X]chi? Will the newer version of KH Chi be any different from the japanese? If it is how is it going to be any different? Will we have more options in keys, cards, or customization? That's something that no other KH game really had, customization. Other than KH BBS where you could change the color of the armor you where wearing in the Marriage Arena. There probably won't be any major changes from the Japanese version in terms of gameplay, but there may be differences in how events, avatar costumes, and medals etc. are rolled out. Also, you will only be able to join a party with players that are in the same union as you, so if you and your brother are planning to join the same party, make sure you join the same union! You can change your union at any given time though, but it costs a small amount of Jewels, which are obtained either by purchasing them with real money, or earning them for free through daily challenges and login bonuses. X[chi] is actually the PC browser game, to which the mobile version (Unchained) is fairly different. What we are getting is the English version of Unchained, and there will be no difference between the Japanese and English releases. If it is how is it going to be any different? Will we have more options in keys, cards, or customization. Unchained uses medals, not cards. 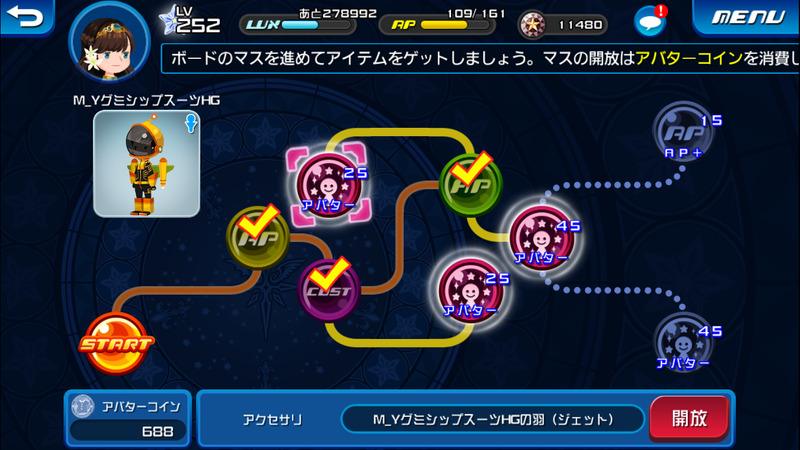 Rather than building two separate decks for Attack/Defense and Lux%/HP as you would on PC, you simply equip 5 medals to each Keyblade. As for those, Keyblades are the same but the PC version has offered an event-exclusive Keyblade that is currently not available in its mobile counterpart. You also have the option to use both the male and female avatar in Unchained. We'll see if they've added more customization but in the Japanese version, the outfits are gender-specific, meaning you cannot dress a female avatar in the male outfits and vice versa. You can find any player regardless of their Union, so long as you know their unique player ID number. Thank you for the wonderful explanation that differentiates Chi from Unchained. I've only ever met people who've either played one or the other, and both sides have had difficulty explaining the gameplay differences to each other. Though, I do have a few questions as someone who's played Chi but not Unchained (just to catch up to Unchained X as quickly as I can). 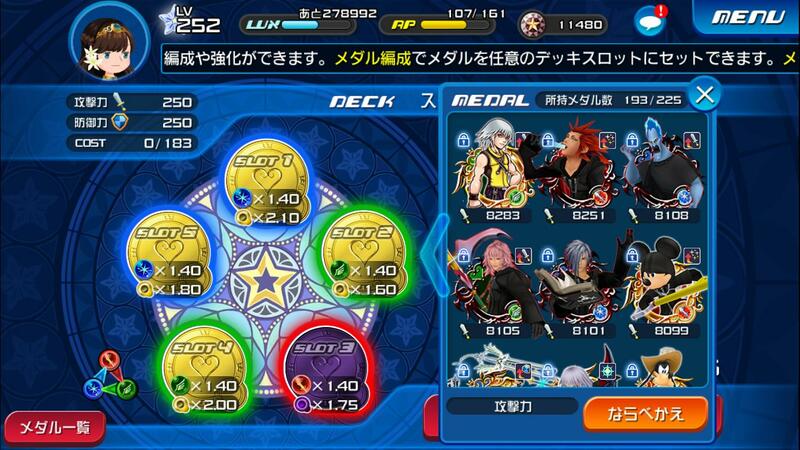 Rather than building two separate decks for Attack/Defense and Lux%/HP as you would on PC, you simply equip 5 medals to each Keyblade. No more worrying about an Assist deck in Unchained! Which I guess is both good and bad? Unchained introduces a new feature called the "Avatar boards", which contain not only outfits for your avatar, but also stat boosts for HP, AP, and Deck Cost (to use more powerful medals). You can redeem these with Avatar coins, which are obtained by fulfilling specific requirements in each quest. So instead of having to worry about the best cards, you can just go through the boards and pick and choose what upgrades you want to get. As for Lux, In X[chi] where it is obtained from all the different enemies, Unchained uses Lux as EXP for leveling up instead! Also, Lux EXP in Unchained is obtained not by how many enemies you defeat or how powerful they are; rather, it is determined by how many hits you are able to land on them. Like in X[chi], Keyblades in Unchained comes with their own unique set of attributes, such as Starlight being better suited for all medal types and Treasure Trove being better for just Power types. The 5 slots in each Keyblade also have their own stat bonuses, which are upgraded along with the Keyblade. If you place a medal into a slot that matches the bonus it provides, it will obtain a power up. Also, unlike X[chi] where your cards are utilized in random sets of 3, the medals you use in Unchained are used specifically in the order you place them in the slots, moving clockwise from the top.